The Chinese script is a tool with which you will be able to go some way towards understanding Chinese. This book starts from scratch, explaining the origins of the language and how characters have evolved. It teaches you how to write characters from the beginning and how to understand enough from signs, directions, and instructions. The Chinese script is an amazing tool with which you will be able to go some way towards understanding Chinese, one of the world's most ancient languages, and its culture. 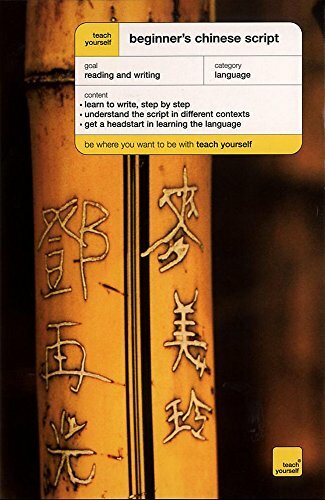 "Teach Yourself Beginner's Chinese Script" starts from scratch, explaining the origins of the language and how characters have evolved. It teaches you how to write characters correctly from the beginning and, through a series of carefully graded exercises, how to understand enough from signs, directions, instructions and even menus to be able to get by. You will surprise yourself with your ingenuity and your ability to guess correctly, based on the sound logic learnt from this book. The book is divided into to main parts. Units 1-4 introduce you to the origins of the Chinese script, explain how characters and words are formed and the basic rules in writing them. Unit 4 ends with a mini test to enable you to check your progress so far. Units 5-9 introduce you to real-life situations such as reading signs, maps, notices and even menus. You will be able to write numbers, dates, tell the time, and fill out simple forms. There is a comprehensive test at the end of Unit 9. Unit 10 explains how to use a Chinese-English dictionary and Chinese word-processing packages with concrete examples. There is also a brief introduction to Chinese idioms. By the end of the book, you will understand how the Chinese script works and will have mastered the basics of reading and writing Chinese. This is the leader in self-learning with more than 300 titles, covering all subjects. Be where you want to be with Teach Yourself.